This little pouch was created to go over my camera, which is some what big compared to those new slim ones. The pattern includes instructions for adjusting the case to fit your own camera! 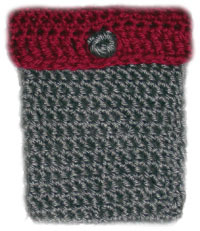 You can also use this small pouch for your phone, keys, makeup, ipod or anything else you want to put into it. Just follow the directions to make it the size you desire. If you need help, feel free to ask me! With main color, start by chaining 15 or a chain that is the width of your desired case. Repeat round 2, 13 times or until the case is as long as you desire. Note: Row 3 starts the beginning of the flap, if you changed the number of chains at the beginning of the pattern, then the number of hdc made on the above row will be the number of chains you made before row 1. Align button with center of row 6 and attach to pencil case with a yarn needle. Need help with this pattern? Let me know and I’ll be glad to help! This entry was posted on Friday, January 8th, 2010 at 2:21 AM by Rachel Choi	and is filed under Free Crochet Patterns. You can follow any responses to this entry through the RSS 2.0 feed. You can leave a response, or trackback from your own site. This camera case is fabulous! I also wanted to let you know that I linked to your crocheted 4-leaf clover from our holiday crochet round-up blog post last week. i’m relatively new to crocheting. can you explain why round 2 starts out with a ch 2? this seems to cause my case to get wider as i build up the height. Hello! The chain 2 at the beginning is used to make the beginning of the round the same height as the rest of the hdc stitches on the round. Without it, the beginning will be shorter and not be leveled. If your case is getting wider and wider, try to count the number of stitches you make after you complete each row. As long as the number of stitches is the same, the case will stay the same width. Hi Natalie! After you do the ch 2 to start the new row you will make your first hdc into the hdc in the previous row, not the ch 2 where the slip stitch is. The only thing that should be in the ch 2 is the slip stitch. Let me know if you need more help with it!